Hey everyone. So that little break turned out much longer than expected! You know I had about 12 draft blog posts with photos uploaded into blogger ready for me to just punch out some text, so I thought it would be really easy for me to do some blog posts from while I was away. Turns out I totally couldn't be stuffed doing it whilst I was on vacation. Go figure? I much preferred to sip a glass of wine and enjoy some quite time after the kids had crashed for the night. I think if there was a decent blogger app that would allow you to type up your blog posts easily, then I would have done some, but booting up the lappy was always going to be a stretch I guess. Just as well I still have those blog posts up my sleeve, because holiday's do terrible things to your nails! I only changed my polish 3 times whilst I was away, so including the polish I wore when I left, I only wore four colours! But because of that I did get some chipping of polish on the corners of my nails. 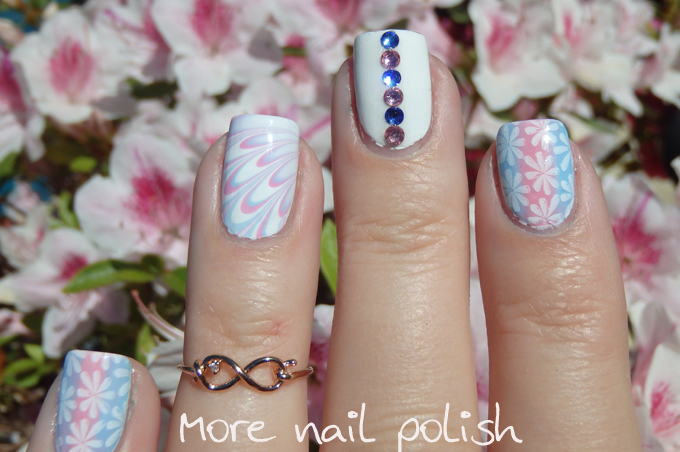 The worst thing for you nails is chipped polish, because that's when you usually break a corner off your nail. I think I lost about 4 corners, so my nails are looking rather rounded at the moment. 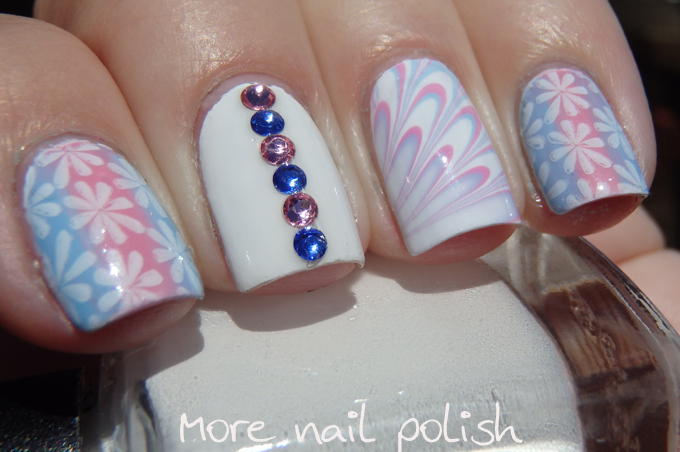 Anyway, lets get onto one of those mani's that I had stored up to post whilst I was away. 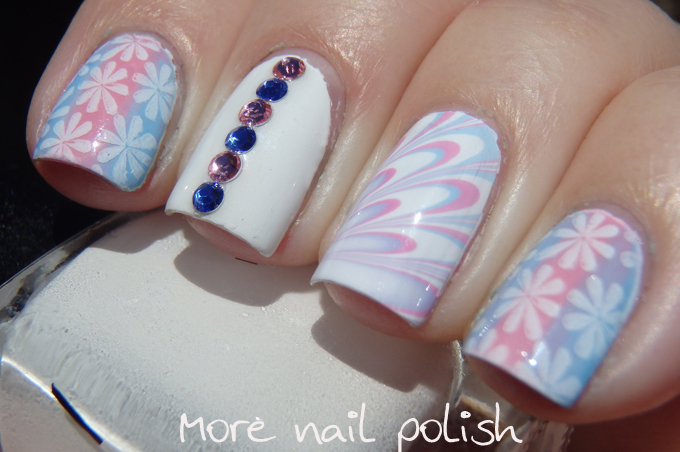 This pink and blue number was a skittlette that just came about rather organically. 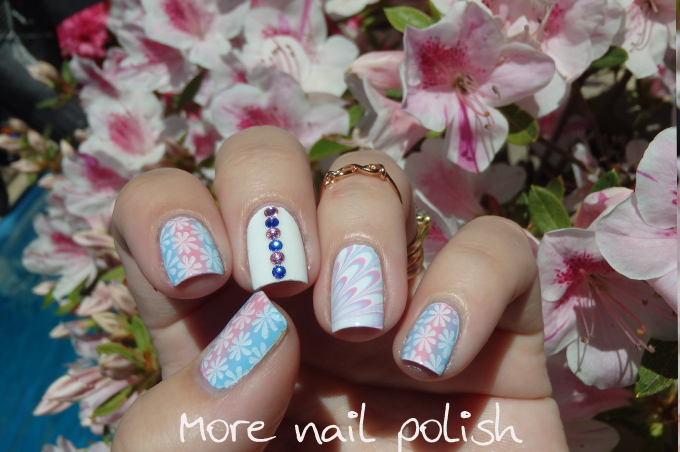 I started with a white base and then painted rough stripes down the thumb, index and pinky fingers using some pink and blue polishes I mixed up for watermarbling. 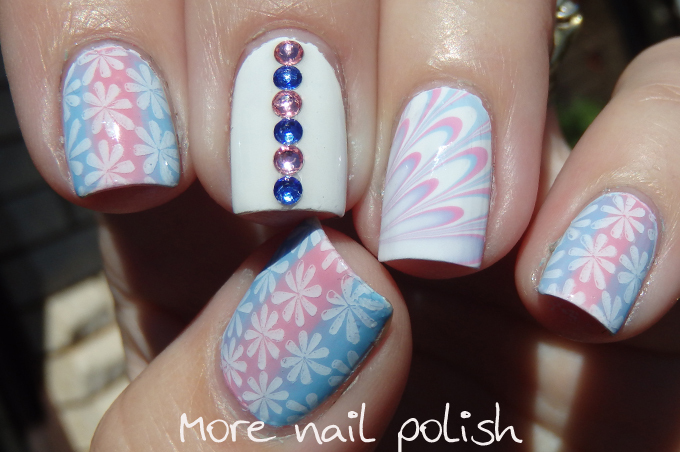 I then used those same polishs to do a watermarble on my ringer finger. 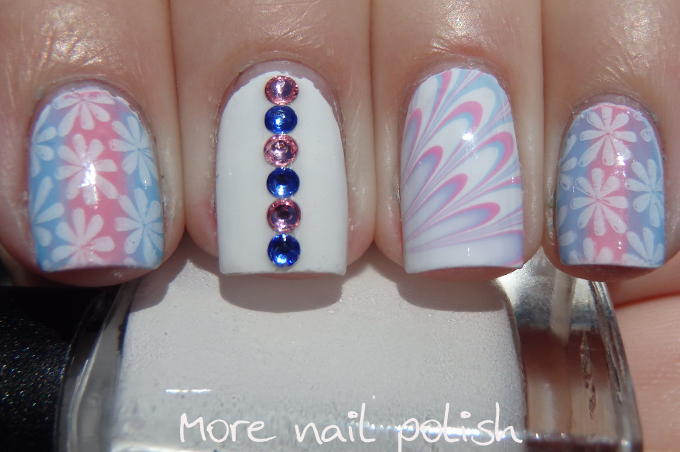 I stamped a daisy design using Mundo de Unas polishes and place Swarovski crystals down the middle on my index finger. I love these next two photos taken in front of our flowering Azalea plants. The flowers are all finished now that I'm home from holiday's, especially as it's been so stinking hot for Spring! Today on our drive home it reached 42 degrees celsius! We are getting this massive heat wave whilst the USA is snowed in! This looks so sweet and makes me long for the spring! Welcome back from the holiday, I know, they always mess up the nails.. I like this design very much!